There’s always something special about a Maui Elopement, and Rosie and John’s was no exception! They were so sweet together and couldn’t stop smiling. Just as it should be! We adore the way they looked at each other, especially during their intimate ceremony at Lahaina Shores. It could not have been more perfect! We love that Rosie chose to wear a nontraditional wedding dress for this Maui Elopement. 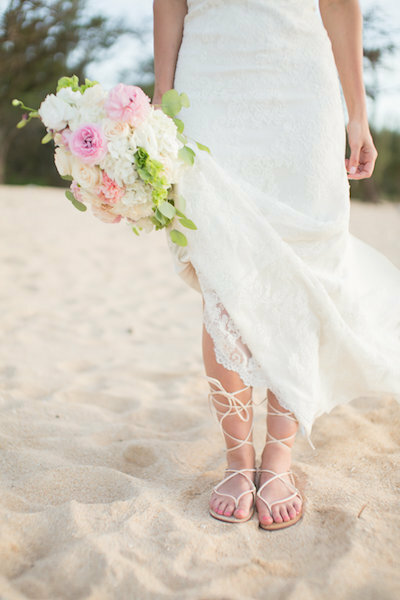 The blush color matched her Rustic Hawaiian Bouquet so incredibly. She absolutely radiated with bridal beauty! 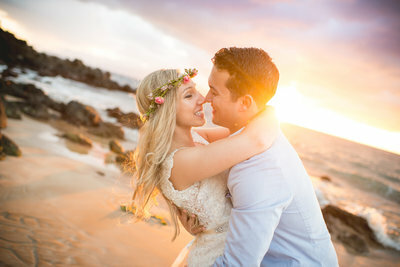 Plus check out the gorgeous light at the beach that surrounded these two on their wedding day. We’re obsessed! After the wedding these newlyweds planned to stay in Paia for a few days, before heading to Kauai for a week, and then a few days in Honolulu! What a wonderful way to start off a wonderful marriage 🙂 . 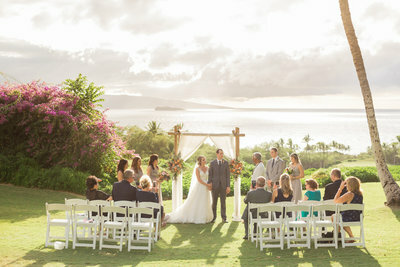 Thank you, Rosie and John, for sharing this special evening with Simple Maui Wedding. We couldn’t be happier for you two! Congratulations and Warm Aloha!